The University of California admissions remain competitive as recent data reveals a decrease in acceptance rates across the UC system. UCSB’s acceptance rate decreased by 0.4 percent despite accepting 2,903 more freshmen in Fall 2018 than in 2017. According to the UC Fall 2018 Undergraduate Admissions Report, the number of people who applied to UCSB surged by 12.5 percent, whereas the number of admitted freshmen only rose by 10.8 percent, making an overall acceptance rate of 32.4 percent. Although UCSB accepted more applicants this year, that does not necessarily mean that the accepted students will be enrolling in Fall 2018. According to the University of California website, the yield rate is the percentage of admitted students who choose to enroll at a UC campus. Historically, schools that have traditionally high acceptance rates — such as UC Santa Barbara, UC Merced, and UC Riverside — have lower yield rates than schools with low acceptance rates — such as UC Los Angeles and UC Berkeley. In Fall 2017, UCSB accepted 26,879 freshmen, but only 4,996 of the accepted freshmen actually enrolled. That is a yield rate of 17 percent, in comparison with UCLA’s 37 percent and Berkeley’s 44 percent. From 1994 to 2017, UCSB’s highest yield rate was 26 percent and its lowest was 17 percent. If this trend continues, the university can expect that less than 6,000 of the 29,782 accepted freshmen will enroll. This year, there was a boost in the number of accepted California residents in conjunction with the steady increase of accepted international and out-of-state students. Last year, fewer California residents were accepted than in the previous year, while the number of accepted out-of-state and international students continued to increase. However, the rising number of non-California enrollment is still below the University of California Regents’ 18 percent non-California resident enrollment cap, as approved in May 2017. The Regents implemented the cap as a result of an audit that “accuses the University of California of hurting local students by admitting too many out-of-state applicants to its campuses,” said the LA Times. The audit alleged that out-of-state applicants benefited from lower admissions requirements, which was detrimental to California residents who wanted to attend the UC of their choice. 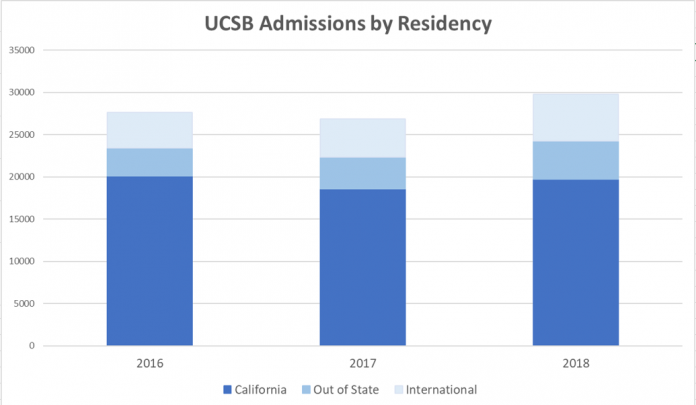 In 2017, the number of accepted California residents fell by 7.7 percent while the number of admitted out-of-state and international students rose by 15 percent and 7 percent, respectively. This year, the number of admitted California residents recovered with a 6.3 percent increase, while out-of-state students enjoyed a 19 percent increase and international students a 22 percent addition. “It is important to note that nonresident students accept offers of admission at a lower rate than California students,” said Danielle Smith, spokesperson of the UC Office of the President Media Relations in an interview with The Bottom Line. Additionally, the University also admitted the largest class of transfers in the history of the University — over 26,000 California community college transfers. “With the benefit of a UC education, these accomplished young people from different backgrounds, with diverse beliefs and aspirations, will make California and the world a better place. We look forward to having them at the university,” said UC President Janet Napolitano in a press release on July 11, 2018.